An update now on a teacher strike that has kept thousands of Chicago students out of the classroom, as the two sides have reached a tentative agreement. NBC 5's Christian Farr has the latest. The nation's first teachers' strike against a charter school operator will end after their union and management struck a tentative deal Sunday that includes protections for students and immigrant families living in the country illegally. 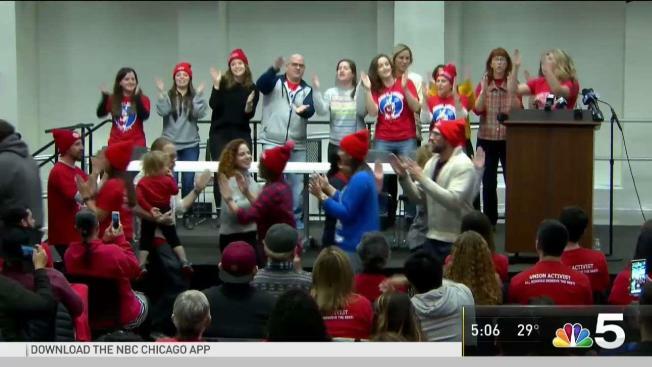 Acero schools and the Chicago Teachers Union reached a "tentative contract agreement" after more than 500 charter school members went on strike last Tuesday. Teachers will return to classes Monday at Acero's 15 schools with 7,500 predominantly Latino students. Robert Bloch, general counsel for the union, said that since the schools' enrollment is "overwhelmingly low-income Latino," the union felt it was necessary to have provisions to protect students, their families and teachers who may be living in the country illegally. The agreements prohibit Acero from collecting and distributing information about the immigration status of students, teachers and families and restricts access by Immigration and Customs Enforcement to schools except by court order, he said. According to the press release Sunday, "the parties agreed to raises for teachers and staff annually over the four-year term of the contract." In addition, Acero Schools agreed to shorten the school year to more closely align with CPS, while also ensuring teacher’s workday be reduced. "Educators fought for more classroom resources, smaller class sizes, sanctuary protections for their immigrant students and fair wages, including a stronger career path for paraprofessionals, with no loss of instructional time," American Federation of Teachers President Randi Weingarten said. "When we join together to fight for our values, and those aspirations and values are just, we win. And the community wins." Officials said the strike ended around 5:30 a.m. Sunday. A vote however, is still pending. The union said the strike was the first against a charter school operator in the nation. The union also represents public school teachers in Chicago.